I am scraping the barrel now on the Light Gun front, but like any good artist I need to suffer for my art rants. Released ’84 in Japan, ’85 in the US, before finally making its way to PAL in ’88 when I was but a bairn, but even a a wee kiddy-winkle I thought it was odd that it wasn’t Wild Gunmen. 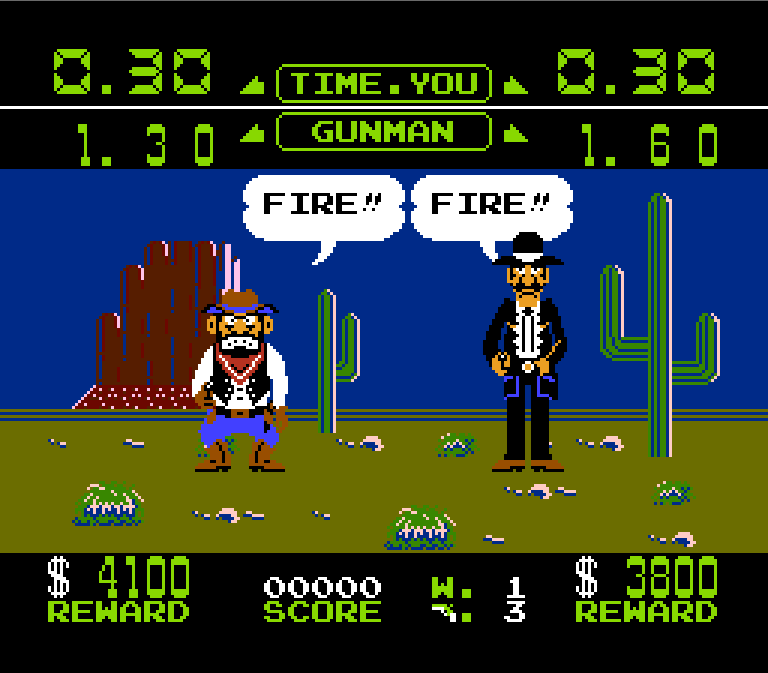 Wild Gunman is a Light Gun game, so you point the NES Zapper at your screen and shoot things till they are dead, on a static background. Enemies will approach (slowly), and you shoot them. Enemies eyes will flash, and that means you are able to shoot them, shoot them too early and you lose the round, shoot the enemy within the time limit and you move to next round. 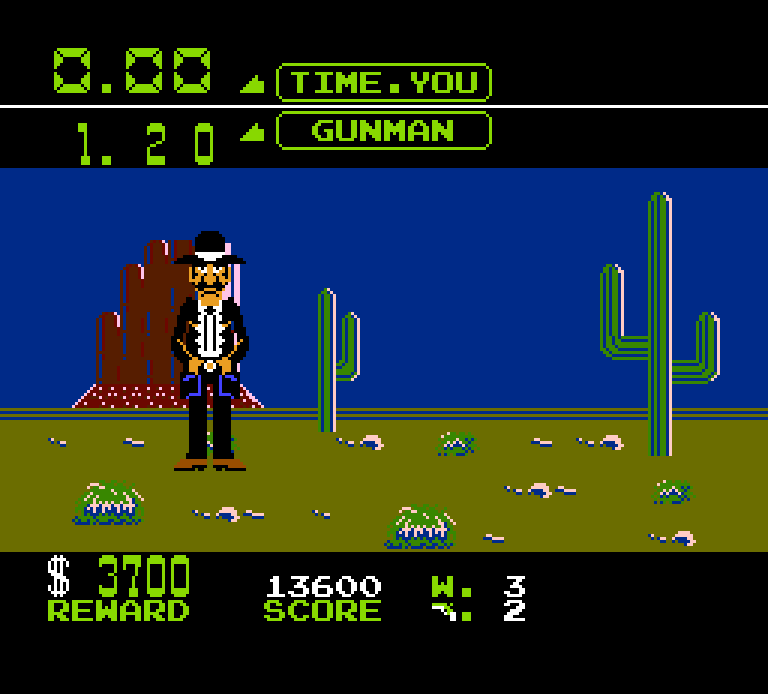 Like Hogan’s Alley, your aim is to beat an enemy within the prescribed time limit, as enemies enter the screen, an amount of time is displayed, and you simple have to beat the time. The lowest is 0.4 seconds, and the longest is around 1.5 seconds. Points are then awarded to you based on how much time you have left with 1000 points per tenth of a second available. 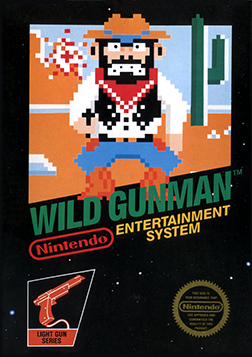 It is a NES Light Gun game… Three modes, all the same, but different. Game A: Is one enemy, shoot him, move on to the next round. It is painfully slow, like in Hogan’s Alley waiting for the bad guy to walk on screen, get in position, and… urrhhmm… Sorry, I drifted off there. You shoot them after the eyes flash. It feels like an age, and you’ll be bored by the 10th round. Game B: It is the same as Game A, except… You shoot TWO enemies. Some rounds one enemy won’t shoot, so you need to make sure you don’t shoot him adding in the “civilian” to avoid, but also the enemies will have different time limits, meaning you need to prioritise your kill order. Game B is a much more fun mode to play, but again, you’re bored by round 10 waiting for the next enemy to get in place. Game C: Is another static screen, but this time enemies will pop out fairly fast. There are 5 windows, and you shoot who pops out. It is faster, and more fun then the other two. After 10 enemies, you move to round two. So if you have played Duck Hunt, you’ll know the game style. All game modes give you three lives, fail a round, lose a life. It is actually quicker standing up, walking over to the console, and resetting it, then leaving the game running to die. For starters, it is too easy. I can put the gun in my trouser pocket, pull the gun out, aim, and hit the target quicker than 0.4 seconds. If you’re holding the gun towards the screen, there is no reason you should ever fail on the time limit. The hit box is RIDICULOUS. The screen is literally broken into fifths, if you’re even remotely in the same postcode as the enemy, the hit will register. The only thing that seems to matter is reaction times. On Game A and B, the enemies stand in the same spot everytime too, it means you’re not even attempting to aim. I could write more, I could try to be funnier, but I can’t be bothered. The game isn’t broken, but it is boring, and not remotely fun. The time you spend waiting for the next person to come onto the screen is like waiting for the arrival of the Flying Spaghetti Monster, aeons pass, glaciers move, lives are lived, all while you’re sat there unable to die. Again, it isn’t bad, and it isn’t broken like Gumshoe. It just isn’t fun, or able to hold my attention for more than 7 minutes, and it certainly doesn’t have the variety of play styles as Hogan’s Alley. 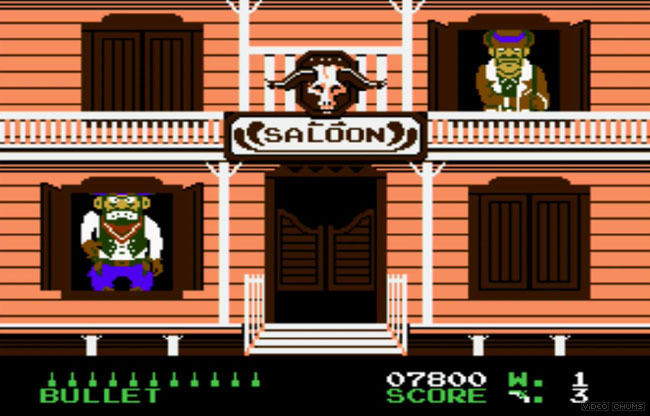 Wild Gunman made me want to turn the Zapper on myself. Pros: Not Gumshoe, isn’t broken, I think YOU are the badguy! Yeah but come on, you can at least get to pretend you are Marty McFly in the far off future of 2015!!! Totally forgot about BttF, I liked the 2nd game mode in Hogan’s Alley, at least added variety. They both suffer from really boring waiting for enemies to load. Was the only game I ever played with the gun. This and Duck Hunt. I preferred Duck Hunt it was more fun. With this dog insultingly laughing each time you miss. I still have nightmares about that damn dog!!! Haha! Ma found this dog to be amusing, was very family friendly shooter. Well, I didn’t invest too much time into the pistol honestly. As I remember there were some response time delays with it and wasn’t as much fun as something like Ninja Gaiden III and Batman Return of the Joker was, with it’s large clear sprites! My NES gun still works perfectly, just needed to have a decent sized CRT. Light Guns didn’t work on small screens, usually. Most small screens didn’t have enough tech inside it to make them refresh fast enough to work with a LG. I didn’t know all that back then 😉 neither did ma.